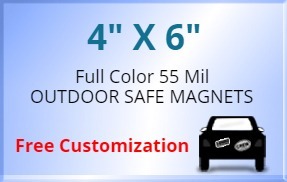 4x6 Custom Magnets - Outdoor & Car Magnets 55 Mil Square Corners are the perfect choice for brands trying to create a striking impact among customers. The square corners and the stronger and durable making let these custom magnets grab more attention easily. Businesses targeting car owners can make use of these magnets well. Made In USA, these custom square and rectangle magnets are also offering lowest price guarantee, free design and free shipping in the Contiguous USA. Order now to utilize full color processing and no set up fee offers. Request a quote to know what you can save on ordering these 4x6 Custom Magnets - Outdoor & Car Magnets 55 Mil Square Corners in bulk.